Please see the list of available designs and fabric options for the front pocket should you wish to place a custom order. 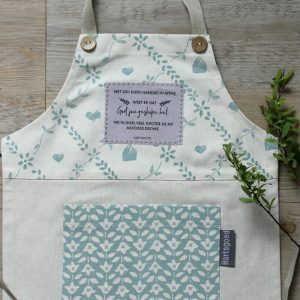 Hartsgoed Aprons are made from the finest quality 100% cotton/linen blend in the heart of the karoo. 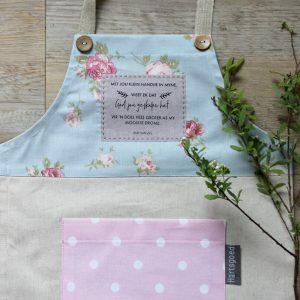 Each design in our Hartsgoed Apron collection is done by the owner, Alet van Zyl. We use a 100% cotton adjustable strap around the neck and natural flax ribbon to tie at the back. The design on the apron is screen printed and the centre front pocket is made from the proud South African Makietie fabric range. 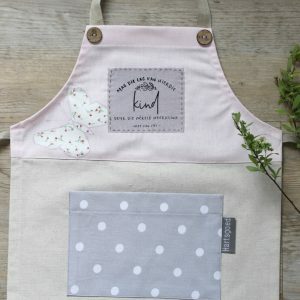 This apron is such a beautiful gift for any lady who loves to cook.